School PA systems | Service Sound | What is a PA system? 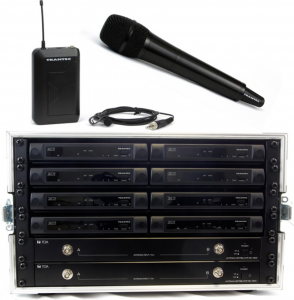 Service Sound – What is a PA system? A good question, so we thought we would share our overview with you. Firstly, let’s just clear up a couple of thoughts on terminology. A PA system, or, Public Address system is a term used to describe a form of loudspeaker distributed broadcast. This, in turn, encompasses everything from a stadium rock-concert sound system to an announcement system in a supermarket. Sometimes you will hear the term ‘tannoy’ system. This is a form of PA system but is more generally associated with intercom systems. These would be the sound systems in places like supermarkets, dentists waiting rooms, school corridors. Generally they consist of a large network of wall or ceiling mounted small speakers. (Tannoy is a brand…people use the term in the same way as ‘I’m hoovering the floor’ Hoover is the brand name but, of course, you are vacuuming !). Next up the food-chain are general sound reinforcement systems. These are larger than intercom systems in both power and quality and generally service just one space or ‘venue’. These would be the sound systems in places school halls, churches, community centres. The larger end of the scale, we would class full PA systems as those installed in large theatres, public auditorium, and concert halls. 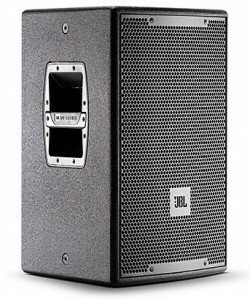 These systems consist of multi speaker cabinets and control equipment. Multi-function mixing desks for main and monitor mixes. There are many ways of building a PA system for permanent installation. What needs to be heard! The answer to these questions informs us of the size of system required in terms of input sources, complexity of control equipment and, output needs. Radio microphones – these come in a huge range of quality which is budget dependant, but, in essence come in three varieties: Handheld transmitter, Headset mic with belt pack transmitter, Lavalier (clip-on) mic with belt pack. 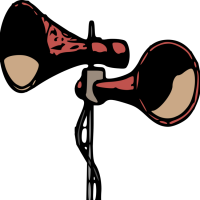 There are licensing rules to consider with radio mics. Mixing desk. This is the heart of any PA system and is used to adjust and mix together the input sources. There is too much to cover on this page about the options available on mixing desks, but, essentially, you need enough ‘channels’ to control all of your input sources. Both analogue and digital mixing desks available on the market. Some applications and users prefer analogue. These mixers offer a knob for every function. 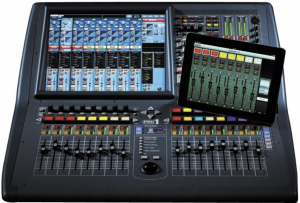 Other setups benefit from digital mixers. These machines offer the ability to recall settings at the touch of a button and are not limited to physical size. They also have the benefit of remote control via wifi or bluetooth from tablets or other portable devices. Outboard dynamics processing. This is equipment than can help the operator control levels from input sources and can also provide protection to the speakers. Speaker processors. These units can be used in-between the output form the mixer before the audio gets to amplification. They allow setup of speaker distribution paths, eq, limiting the audio signal etc. Power amplifiers. These are used to ‘turn up’ the signal from the mixing desk, suitable then for connecting to the speaker system. Loud speakers! again, there is a lot to cover here but essentially these systems need to placed carefully to optimise the sound in the space required. They should be distributed and setup to create an even sound balance from multiple listener positions. They must be capable of reproducing multiple level changes (imagine soft speech to loud rock music). Oh, and they need to sound good! We have just touched on the basics here. Room acoustics, fine-tuning mixer settings, preventing feedback, inclusion of Induction Loops and many many more details can be discussed over tea. If you’d like to know more please get in touch.